Lockpicking has always been a part of the Elder Scrolls games. Whether you wanted to break into someone’s house or open a treasure chest, often you’d bump into a lock which can either be opened with a key (if one exists), with alteration magic or by picking the lock with lockpicks. In Morrowind the lockpicking system is a bit uneventful and based on randomness. You equip a lockpick and click on a locked container until your lockpick runs out of uses or the lock decides it’s time to open. Lockpicking in Oblivion is much more immersive and provided the player with a mini game. The player would have to “feel” the lock by watching the visual effects and listening to the sounds of pins or tumblers being forced up and falling down. Once you know which visuals/sounds to look out for, you can master the art of lockpicking. 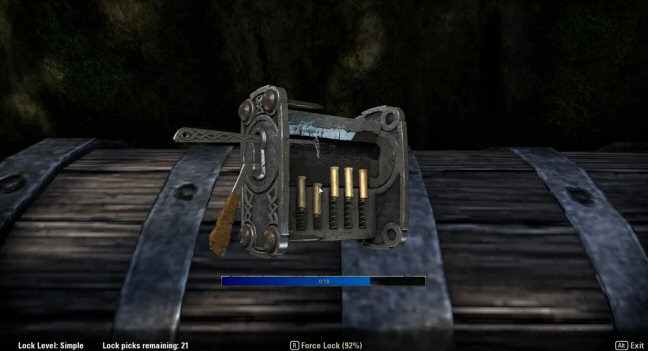 The lockpicking system in Skyrim is mostly visual and quite different from Oblivion’s lockpicking mini game. In Skyrim, the player had to feel for the right tumbler position with a lockpick whilst turning a tension wrench in the lock its self. If the lockpick is not in the right position, it will break from excessive pressure applied by the tension wrench. In Elder Scrolls Online, the lockpicking system bares the most resemblance to that of Oblivion. A lock in ESO contains five pins, all of which have to be forced down into the correct position by using a lockpick. In order to pick the lock, the player has to pay attention to the visual and audio hints for the correct position of each pin. Each time the player fails to force a pin down, there is a chance that the lockpick will break and they are left with one less lockpick. On top of this, the lock needs to be picked within a time limit and you also need to worry about the hostile forces of Tamriel, including monsters and enemy players, who might sneak up on you while you’re working on the lock. Even if you can manage the hostile forces, you still have to watch your back for other friendly adventurers. If you fail to open the chest within the time limit, you will be unable to try and open the chest again for a short period of time. During this time period a cheeky fellow hero could take the opportunity to try and open the lock theirself, leaving you standing in the rain. The environment in lockpicking is irrelevant in Oblivion and Skyrim, because the game is essentially paused every time you start picking a lock. Because ESO is multiplayer, there’s no pausing the game, which is something that you have to keep in mind when trying to bend the lock to your will. The screenshot taken from ESO’s Gathering & Exploration video shows what the lockpicking mini game looks like. The lock level of this lock is simple, which means there’s different levels of lock difficulty. The lock level means a lot of things. The time limit for solving the lock is shorter for more difficult locks, and way the tumblers respond to the lockpick could is more sensitive. The higher the lock’s level, the easier it is to mock things up and break lockpicks. We can also see a Force Lock option which is keymapped to ‘R’ by default. The Force Lock success rate on this lock is 92 %, so it seems that at least the easier level locks could be forced open with a reasonable success rate. We can only guess how the force lock success rate is calculated at this point, but a similar mechanic called Auto-attempt exists in Oblivion. The success rate of Auto-attempt depends on your lockpicking level (security in Oblivion) in relation to the difficulty level of the lock. The higher the lockpicking level, the greater the chance that the lock can be forced open, and less lockpicks are lost in the process. I find that lockpicking can be easily done without looking at the screen at all. I’m not saying you should do it, but it’s definitely possible because the game gives you two kind of hints: audio hints and visual hints. The very moment the tumbler begins to drastically shake, that’s your cue to click on it, instantly. Listen carefully to the sounds the tumbler is making as you push the tumbler further. I guarantee you will notice a pattern which you can use to successfully pick any lock by just listening to the audio. You can buy lockpicks from Merchants in towns. Looting the starter area in Coldharbor is an excellent way to gain lockpicks, too. It’s a bad idea entering Tamriel without any lockpicks, make sure you get one asap. 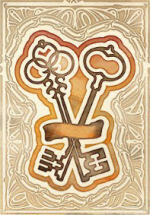 …when you increase your skill in lockpicking, you’re able to get better and better gear. Your lockpicking will automatically improve as you level, gradually making chests that were once very difficult to open a much easier prospect. Though your lockpicking skill will increase as you level, the chests you encounter in higher level areas will also be more difficult. Paul Sage’s quote can be interpreted in a few ways. Maybe there is (or will be) a unique skill line for lockpicking in Elder Scrolls Online. Maybe players will gain access to Skyrim-like perks for lockpicking in the form of passive skills which would make lockpicking easier in one way or another. Another, and in my opinion perhaps a better interpretation, is that by being more skillful in the lockpicking mini game as a player, you can open more difficult chests and thus get more and better items. It seems to make sense when you look at the quote from the ask us anything segment. Either way, ever since Oblivion lockpicking has been a fun mini game which rewards players with keen eyes and ears (having a ton of lockpicks in your bags doesn’t hurt, either). I can definitely see this trend carrying over to Elder Scrolls Online. ← Leaked: Play as an Imperial in ESO?